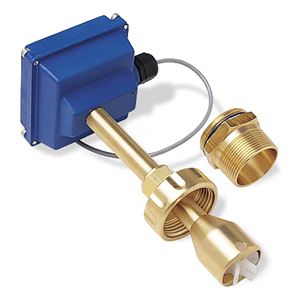 Installs in a Wide Range of Pipe Sizes From 3" to 40"
Ruby bearings and a non-drag pick-off give these adjustable insertion flow sensors the widest flow range of any of the paddlewheel types. A Hall-effect device detects the passage of miniature magnets in the six rotor blades. The resulting square-wave signal can be sent hundreds of feet without a transmitter, over unshield cable. This signal can be connected directly to many PLCs and other controls without additional electronics. A depth adjustment system allows two basic sizes to cover pipe sizes from 7.62 to 102 cm (3 to 40"). Note: Customer supplied pull-up resistor may be required - 2 to 10 kohm.